Praise be to Doc Hammer and Jackson Publick! 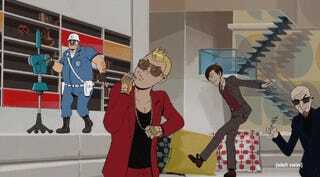 Yes, after a long wait, The Venture Bros. are back. This season is like a makeover. Personally, I think it will take a while to get used to the massive shift in the Venture-verse. However, I like that it went from a cult show to a big deal. RIP, of course, to J.V. Jr., and to the Sovereign. Regarding the Sovereign, I am still not over his IRL passing. Fun fact: I started watching when I was 13, and I feel old, but no fucks given.